This page shows you how to get started quickly with the zootoolbox. Actually, if you know how mel scripts work then you probably don't need to read any further. Ok, I will assume that you have installed the zootoolbox mel scripts and icons, updated Maya.env and restarted maya. A mel script can take many forms. The maya interface is built from hundreds of mel scripts. When you click a button or select from a menu mel commands are executed. The zootoolbox is a collection of mel scripts that can be launched in a variety of ways. The MEL command line, near the bottom left corner of the maya user interface is where you can enter mel commands and this includes running mel scripts. You simply type the name of the script you wish to run and hit the [ENTER] key. Try typing "zooCST" into the MEL command line (without the quotes, and it is case-sensitive). After you hit [ENTER] the zooCharacterSetupTools User Interface window should open. Another way to enter mel commands is via the Script Editor window (from the main window menu Window|General Editors|Script Editor). 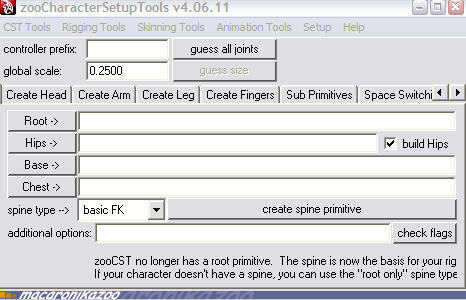 The zooCST command worked because a mel script called zooCST.mel was found in maya's scripts path. If you look in the zoo scripts folder you will see many mel scripts. While some are meant to be launched like zooCST, many are not - so how do you know the difference? Luckily there is a mel script called zooToolBox.mel that creates a user interface for launching most of the tools. This makes using the zoo script collection much easier. Type zooToolBox into the MEL command line (notice how we leave off the .mel part of the script name) and hit [ENTER]. You can use the zoo Tool Box window menu Shelf|Install Shelf Button to add a button to your current shelf and save you some typing next time. Now, I'm guessing that at this point you are wondering why the zoo Tool Box UI has many blank buttons. If they are all blank, then you did something wrong when you put the icon files in your prefs\icons folder. But if you are missing just a few then that's normal. Hamish say's he hates creating icons and he did not get time to make them all. The tooltips work though, so turn them on and hover over a blank button until a description pops up. For many of the buttons you can right-mouse-button click on them to open a help window. From here you need to explore and experiment. Some tools are obvious and some will require careful reading of the help screens to get the hang of. Have a look at zooShots. It's a great one to start with. 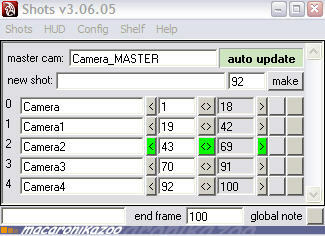 It creates a master camera and connects it to a list of slave cameras, so that you can cut from one to the next, with an easy to understand interface. No doubt you will find things that dont work. Feel free to leave me a comment and ask questions. I dont claim to have all the answers, but I will be glad to help if I can. There are some zoo tools I have never used, but the ones I do use have become an essential part of my working methods. i'm getting error messages fairly often about the missing icons. even for some that are actually there and i can't get new ones that i make to be recognized either. i've tried putting them in the default 2008/prefs/icons and in a dir that i specified in maya.env i also got the tif file for the bottom of the gui off google code, that one loads fine. is this a typical problem with xpm icons? What os are you on? I have heard of people having problems with xpm file in vista. The icons appear to be missing, but it turns out that they are actually there, but maya on vista says they are invalid. I dont actually have vista to check, but I think this could be a vista/xpm issue rather than something specific to maya. If its not that, then I'm not sure. I have set up these tools on many systems (xp and win2k) without any problems. sorry... running maya2008 on XP mediaCenter SP2. all your examples referred to same OS and versino of Maya. that's why i thought it was odd that i was getting this behavior. here's a couple more specific questions if you don't mind. 1. do you just create xpm files with the name that zooTools is looking for and it finds them? 2. do you load zooToolBox or just install specific tools to a shelf and run them from there? 1. yes - if the correctly named xpm is in the icons folder the toolbox will find it. Maya can be fussy about xpm format though. I use 32x32 pixels with 128 colors. I create a .bmp in photoshop and use XnView to convert to xpm, but I then must edit the xpm in a text editor and remove "const " from the 2nd line (or maya will say it is invalid). 2. I prefer to use the normal maya shelf system. I created a zoo shelf which contains the tools I use most often. I found the zooToolBox UI most useful when I was first exploring the zoo stuff, but now I dont use it as much. Also, maya caches bitmaps when it first access them, so it will not recognize changes to a .xpm file until you restart maya. So if you get a message about a missing icon, and you create one with that name, maya wont see it until you restart.